Radial's Alight Race Saddle is a decent performer at a brilliant price, putting many expensive saddles to shame in terms of finish and performance. You need a decent pad in your shorts, though, as it's on the harsh side. 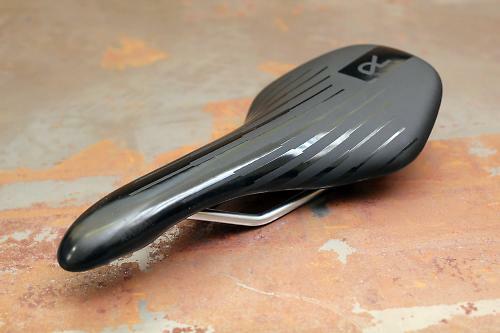 The Alight is a racer's saddle, one for those who like to spend a lot of time crouched in the drops. It has a slightly dropped nose and dipped mid-section, offering a comfortable position for really putting the pace down. When I say comfort, it's relative; it's not the type of seat you want to go out smashing a century on. While there is a small amount of padding to take the sting out, it's not exactly plush. If you're gifted with 'sprinter's thighs' you'll get on well with the narrow shape. At its widest point the Alight measures 127mm, which then sweeps in to give a long, narrow nose, meaning you get no rubbing on the insides of your thighs. The rear swoops up a bit, giving you a decent ledge to push against, especially when moving back on the saddle for climbing. Considering the £19.99 price tag (currently a 'special' £15.99), the overall weight of 244g is pretty impressive, especially when you take into account the chromoly rails. The width is spot on, fitting straight into the clamp of the seatpost with no need for tweaking, plus you get plenty of fore and aft adjustment. The upper is hardwearing and very much scuff resistant, with the matt finish having a rubber-like feel that offers decent levels of grip in the shiniest of shorts. 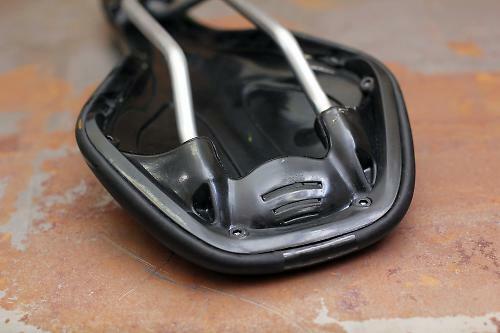 The finish under the saddle, where material meets base, can often be the downfall of cheaper saddles. Large industrial staples and rough cut edges are often the norm, but you don't get any of that with the Alight. The material is neatly finished, pulled tight and held in place with plastic buffers, tightened with set screws no less. The rest is glued and while still stapled, they're small and discreet. In fact I was surprised to find the price was less than 20 quid – I'd assumed it would be at least double that with this attention to detail and neatness. Overall the Radial Alight Race is a great race saddle that isn't just aimed at the entry level of the road bike market. The shape suits those with larger thighs and riders who need a really solid seat to push against when they want to get the power down. The finish is great for a saddle of this price – well, any price in fact, and the hardwearing nature of the material should see it last for years. Radial say that the Alight is a racer's saddle, and going by the shape they are spot on. For rides in the drops the narrow and dropped nose is perfect. Really good quality, excellent to see at this price point. Does the job it's designed for well. 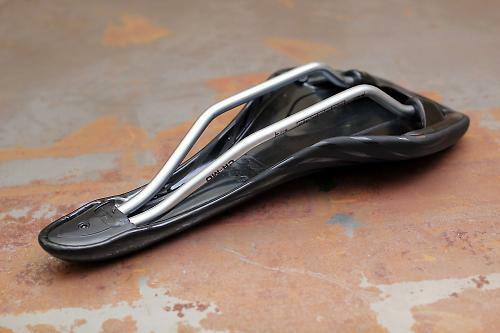 Solid, but considering it's designed as a race saddle comfort is relative. Really impressed with the price/performance ratio here. Very well indeed, for the style of riding it's designed for it does the job without issue. Not ideal if you have one bike that you ride fast and sometimes do long distances on. The Radial Alight Race is brilliant at this price point. Lots of attention has been spent on the finish and quality, which is a great place to invest. The ride may be solid but if you are using it for its intended purpose it's hard to fault.